The coffee of the highest quality is still shaped and freshly ground beans if it will be brewed, so really awake flavor. Excelso cafe was established to support the marketing and image to be created for the coffee Excelso. By selecting the upper middle class market, the coffee Excelso can only be found in certain supermarkets and at Kafe Excelso own. With the cafe Excelso, then the public can enjoy coffee brewed directly so booked (ground and brewed directly in the engine), with the best quality of coffee that are only in Kafe Excelso. 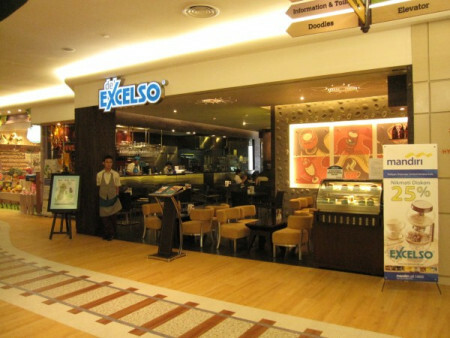 Since it was founded until now, Excelso continues to grow in the number of outlets, the concept of service, design and type of coffee, food and drinks were served. This is in line with the demands of the people who made the coffee as part of the lifestyle. Whatever the concept of the run, coffee remains the main menu in Excelso. Visit Excelso de'EXCELSO or cafe, then a wide selection of coffee can be found on the first pages of the book menu. In addition it also created a variety of coffee drinks with a mixture of both hot and cold, for example some very famous drinks are Avocado Coffee, Coffee Float, Mega Mocha Shake, Pearl Coffee and Frappio, namely frozen coffee drink that is very delicious with multiple choices of taste. But of course, in Excelso available also a selection of beverages that are not made from coffee, especially for those who do not like coffee. Wide selection of teas and fruit drinks with the basic ingredients available to you.